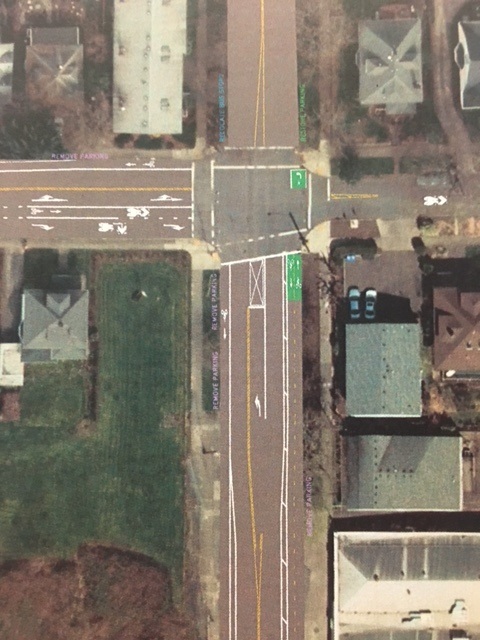 PBOT project to re-stripe NE 20th/21st Avenues at NE Multnomah St. Representatives from the Portland Bureau of Transportation (PBOT) briefed the SGNA Board at its August 9th Board meeting about their plans to re-stripe the intersection of 21st and Multnomah and the overpass south to better accommodate bicycles and provide some improvement for cars at the intersection. This was the third presentation PBOT has made to Sullivan’s Gulch about the proposals, but the first to the full Board — the previous times were to the Land Use and Transportation Committee, which expressed dissatisfaction about some of the aspects of the previous proposals. During the presentation the PBOT representatives indicated they had funding for the project and were ready to go forward with this proposal. They suggested the painting of the new lanes would take place almost immediately and other work would continue through September – the end of fiscal year 2016. The SGNA Board is considering how to respond to the apparent lack of willingness to incorporate suggestions made by the Board. ​of bike lanes and pedestrian crossing. We list below the concerns raised by SGNA Board members and guests during the PBOT presentation. While the Board unanimously opposes the project, not all these concerns are shared by all Board members. Our consensus is that none of us like the project as is; but these are concerns raised by Board members individually, rather than by a vote of the Board. Since Multnomah Street east of 21st Avenue is classified as a neighborhood street, the project cannot make changes to east-west traffic through this intersection. However, Multnomah Street east of 21st bears much greater traffic than most neighborhood streets, especially at times of high traffic — for example, when many American Property Management vehicles are leaving their maintenance headquarters in Sullivan’s Gulch to manage properties around the City every morning and throughout the day. Over the past few years, navigating this intersection at 21st and Multnomah, especially for traffic turning left (south) from Multnomah, has become increasingly dangerous for cars, cyclists, and pedestrians. It is only through great caution and often waiting several light cycles, that cars are able to make this turn while avoiding eastbound cars either making a right turn from Multnomah onto the same bridge or continuing east on Multnomah through the light. With pedestrians and cyclists using the south crosswalk at this intersection, many close calls are reported widely among neighbors. At least one death has occurred at this intersection. 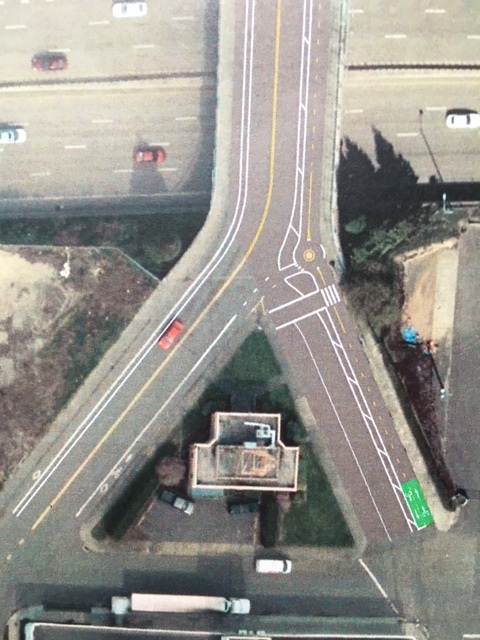 This project does not address concerns for how the light operates at this intersection. We really need a protected left-turn signal for traffic turning south from Multnomah. The northbound left-turn lane on 21st, for turns west onto Multnomah, is planned at only 9 feet wide. Trucks cross this bridge constantly and are typically wider than this space allows. While a left-turn lane with dedicated signal is an important improvement at this location, the width of the lane is minimal, considering the speed of traffic passing north on its right and, further right, the proximity of new cycling traffic passing through the intersection south onto 21st. Why do we need a two-way bike path along the east side of the bridge, when there is already a southbound bike lane on the west side and a northbound bike lane on the east side? First, this would require that cyclists on Multnomah to pass through the full intersection before turning south onto this new two-way bikeway on the west side of 21st, rather than making a simple right turn onto the already existing southbound bike lane. Also, we believe many cyclists will find two-way bike paths confusing to navigate, especially one as short as this. The small roundabout striping on the south end of the bridge, which orients cyclists entering the bike path from both 20th and 21st Avenues, looks potentially confusing, and close to the large truck traffic leaving north from the Sunshine Dairy at this location. Our concern is that this roundabout will force cars even closer to the southbound bike lane, already uncomfortably tight as it rounds the bend. The sidewalk used by pedestrians crossing on the west side of the bridge is very problematic as it disappears right at the point that 21st Avenue curves left after leaving the bridge, causing motorists, cyclists, and pedestrians on both sides of the street to take special care. Why is there no plan to extend the sidewalk further south in this area? In spite of assurances, we’re not convinced this project has taken into account the large apartment development (PHK) currently permitted for 21st and Multnomah, with its parking garage entrance on 21st just before the north end of the bridge, along with the increased traffic of new residents at this location. Motorists entering this driveway will need to cross over the dedicated bike lane, but there is no plan for striping that controls this entrance/exit. With this new development and the much larger development coming to 1400 NE Multnomah, all types of traffic at this intersection will increase even more. This intersection is already a major choke-point for traffic crossing over I-84, so we see this as a looming problem likely exacerbated by this project. While thinner lanes for cars and new timing for the light may bring traffic calming, this will not change the inherent problems with crossing 21st Ave. on Multnomah. Providing an enhanced pathway for cycling in this one-block area will encourage more cycling on 21st Avenue, which has no bike lanes or other protection for cyclists both north and south from this area. 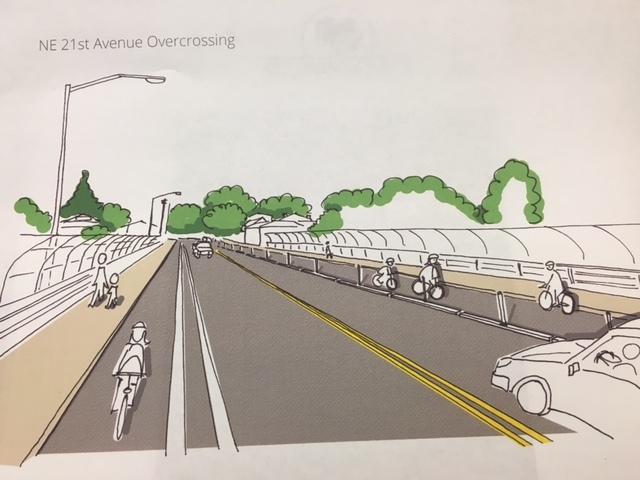 This will only increase the already urgent problems with cyclists using one of the busiest north-south routes in the City, rather than encouraging them to use the new 20’s Bikeway being constructed on NE 26th/28th Avenues, passing over the 28th Avenue bridge only seven blocks from this location.